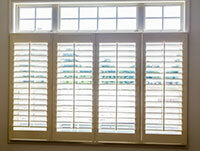 Spruce up your home with beautiful Composite Plantation Shutters. 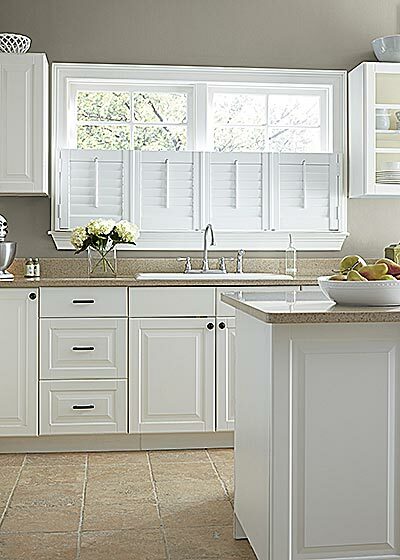 Made from a PVC base, our plantation shutters are fade resistant (much like our faux wood blinds) and are easy to clean with mild detergent and water. All of our shutters have solid louvers and stiles, not to be confused with lesser quality shutters made of hollow plastic. Our Shutters can also be ordered in Real American Hardwood. 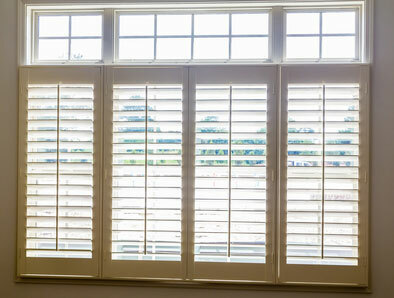 Our plantation shutters are available for inside or outside the window frame mounting configurations. Our Composite Shutters are built to last a lifetime and are available in the most popular louver sizes. Our Shutters are also available in real wood. Choose from 2 ½” or 3 ½” louvers then select from options such as a divider rail or hidden tilt bar. 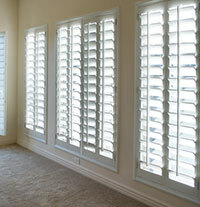 These Composite Plantation Shutters are perfect for high humidity areas and can be used in any room of the house. 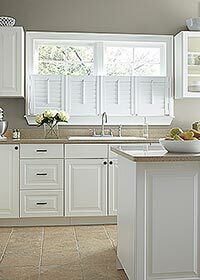 All of BlindsOnline.com's shutters are custom built to your specifications just like all of our window treatments and can be made to fit any window size. These Plantation Shutters are also available in Real North American Hardwood, just select "Make as Real Wood" during checkout. At Blinds Online, our custom plantation shutters are made from a composite material that will give you the look and feel of real wood, but at a better price. We use this same strategy with our high-quality faux wood blinds as well! These shutters are designed to not only improve the look and function of your windows, but also, last for many years to come. Place them in any room of your house today (even those in high humidity areas)! Cleaning is easy with mild detergent and water. 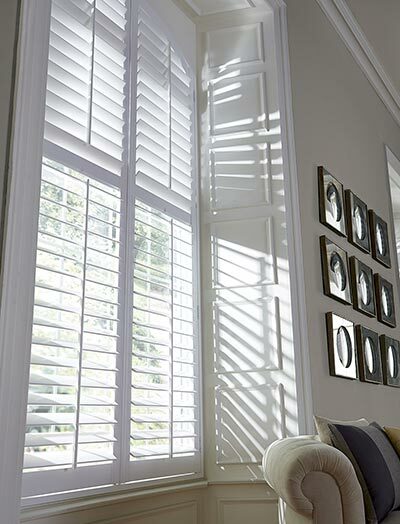 We have a full range of options available with our plantation shutters. We’re able to make them in the most popular louver sizes and colors, and offer such options like divider rails or hidden tilt bars. We also cater to your exact sizing specifications, so there’s never any problem with the design, fit or installation. 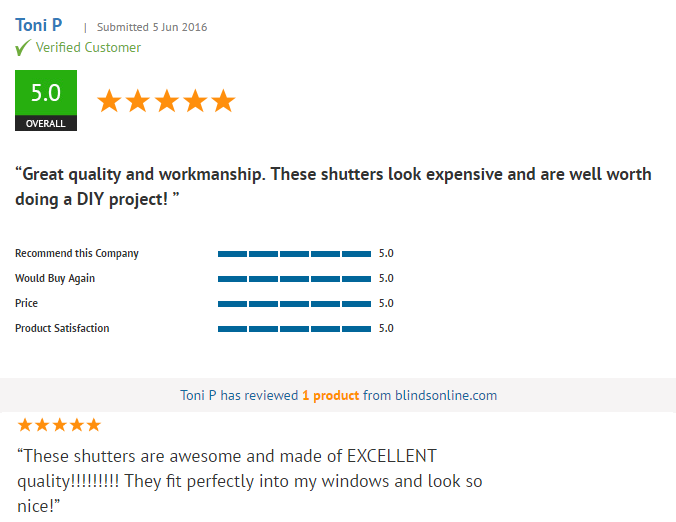 So, shop from our range of plantation shutters today! Classic, versatile, low cost and built to last a lifetime, there’s nothing better. When ordering Plantation Shutters from Blinds Online, you have the option of having your real American hardwood plantation shutters or our solid pvc base shutters. When deciding between wood plantation shutters and faux wood plantation shutters, it is important to understand that there are drawbacks and benefits of each type of plantation shutter. In dry, moderate climates, using real wood plantation shutters is not problematic. However, if you live in a climate that has extreme temperature fluctuations or high humidity, we recommend the pvc based plantation shutters. Blinds Online is one of the few retailers online that can offer you both wholesale pricing and free shipping on non-oversized orders. Saving money in two different ways means that you can afford to update your window treatments without breaking the bank. 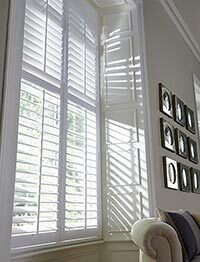 Our affordable and attractive plantation shutters make your home feel open and comfortable. Additionally, plantation shutters can provide a level of insulation to lower your heating costs in winter and your cooling costs in summer. 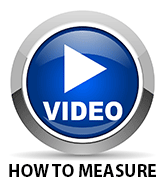 Outside Mount width is Frame to Frame not panel width. When using Inside Mounted Shutters on Tilt in Windows, shutters may interfere with window operation. Divider Rail is 3” tall and come standard on panels over 72”, optional on smaller panels. Inside mount shutters mount on hang strips. Outside mount shutters mount on 4 sided L frame. Perfect for high humidity locations. Easy to clean and color will not fade. 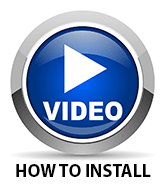 **When installing shutters in same room and/or side by side, shutters must be ordered at the same height to ensure divider rail locations will match. *Inside Mount or Outside Mount: *Requires min. 3” mounting depth in window frame. "Excellent friendly service. Great quality. Looks beautiful"
"Excellent product and customer service. Will be ordering again for my other windows soon. Thank you." "Great plantation shutters. Will buy more to finish the house." "Absolutely perfect quality and style."